With a metro card, people in Beijing can travel around the city easily. The Beijing transportation smart card, called yikatong, can be used on all subway lines, city-buses, some taxis and the Airport Express Train. People can get 60-percent discounts on city buses with the card. 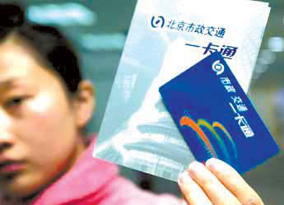 What's more, the card can be used at some designated supermarkets, long-distance bus lines and the expressways in Beijing. The public telephones along Chang'an Avenue also accepts the card. mài kè: lì li, bù hǎo yì si, nǐ néng jiè wǒ diǎnr líng qián ma? wǒ yào mǎi chē piào. Mike: Excuse me, Lili! Could you lend me some small change to buy bus tickets? lì li: dāng rán kě yǐ! nǐ wàng jì dài yī kǎ tōng le ba? Lili: Yes, of course! You forgot to bring your metro card with you, right? mài kè: hai, bié tí le. wǒ de yī kǎ tōng huài le, gāi qù nǎr huàn a? Mike: What bad luck! My metro card won't work. Where can I get it replaced? lì li: ni děi dào fù xīng mén dì tiě zhàn qù huàn. Lili: You need to go to Fuxingmen Subway Station to replace it. mài kè: néng tuì huán kǎ de gōng běn fèi ma? Mike: Can I get the card deposit back? lì li: rú guǒ kǎ yǒu sǔn huài, kǎ de gōng běn fei jiù bù néng tuì huán le. Lili: If the card is damaged, the deposit cannot be refunded. mài kè: nà kǎ lǐ de yú é ne? Mike: What about the balance on my current card? lì li: kǎ lǐ de yú é huì zhuǎn dào xīn kǎ lǐ. Lili: The balance of your current card will be transferred to your new card. mài kè: yuán lái rú cǐ. wàn yī wǒ bǎ kǎ diū le zěn me bàn? Mike: I see. What if I lose my metro card? lì li: kǎ shì bú jì míng de. nǐ děi chóng xīn bàn yī zhāng. Lili: The metro card is unregistered so you have to apply for a new one. mài kè: kàn yàng zi wǒ zhǐ hǎo pǎo yī tàng le. cóng zán men gōng sī qù fù xīng mén zěn me zǒu? Mike: It looks I have to make a trip to Fuxingmen. How can I get there from our company? lì li: zuò dì tiě qù zuì fāng biàn, zhōng tú bú yong dǎo chē le. Lili: The most convenient way is to take subway. You won't have to change buses on the way. mài kè: hǎo, nà wǒ jiù tīng nǐ de, zuò dì tiě qù. lái huí shí kuài qián gòu le ba? Mike: OK, I will take subway as you suggested. Is 10 yuan enough to get there and back? lì li: rú guǒ nǐ bú zài qù qí tā dì fāng, nà jiù zú gòu le. Lili: Yes, it is if you don't want to go to any other place. Lesson 70 Are you going to work overtime today? Lesson 71 Mike needs a Chinese driver's license! Lesson 72 Report the loss of your passport to the local police station! Lesson 73: To live a healthy life!